So I finished my charm quilt that was the first project for my Quilting Quickly class over at craftsy.com. I wound up breaking it up into nine patches because I thought it would be way too busy otherwise. There’s only one huge problem that I didn’t notice until about twenty minutes ago, and that is the fact that the middle square on the bottom row is about a quarter inch too large for some reason, and the sashing doesn’t line up. But hey, at least it’s done right? 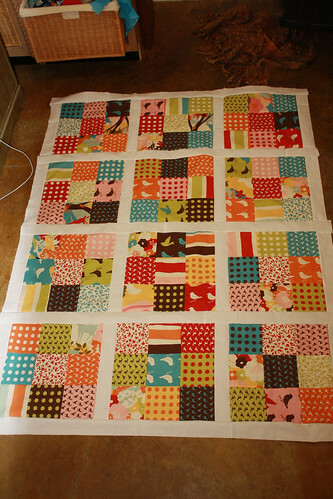 Also I opted on piecing together the longer horizontal sashing. I’m hoping that it won’t be too noticeable, but my lack of ability in cutting long straight lines made using the pieced jelly roll lengths a good idea. After it’s all said and done, and despite that one issue, I actually think I learned some things on this very basic project, and if nothing else, it gives us a quilt to work on when we take our long arm classes.